Lock in a great price for The Royal Clarence Hotel 18+ only - rated 8 by recent guests. Clean rooms and linen, friendly staff, local amenities close and easy to find, beach literally outside the hotel. Room was a decent size and clean and tidy. Staff were very friendly and helpful. Everything was fab, comfy bed, lovely bathroom, great host, fab location - can't wait to come back- oh and an alcoholic vending machine!! Very friendly and clean. Loved the option to bring food in to the hotel and sit in a room over looking the sea. Great location, Pete on reception very friendly and informative. Room great condition, bathroom looked brand new. Free parking opposite the beach. No frills tidy accommodation. Excellent entry systems. 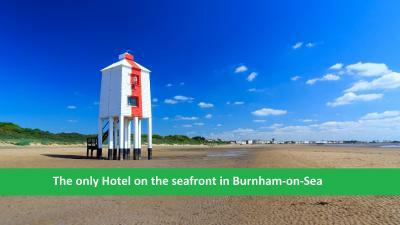 The adults-only Royal Clarence Hotel is the only hotel situated on the seafront in Burnham-on-Sea. Free WiFi is available in public areas of the building and in most of the bedrooms. Each room at The Royal Clarence Hotel has a flat-screen TV, tea and coffee making facilities, and a hairdryer. Bedding and bed linen is provided. Towels and toiletries are provided. Some rooms offer sea views. Guests can enjoy far-reaching sea views toward the North Devon and Welsh coastlines in the seafront veranda. There are several restaurants, cafes and pubs located within a 2-minute walk of the hotel and guests are welcome to bring takeaway food back to be consumed in the first floor seafront veranda. The property also has 2 vending machines offering sweets, snacks and drinks. The hotel is located just 2 miles from junction 22 of the M5 motorway. Hinkley Point C is 21 miles away and can be viewed from Bridgewater Bay. Championship Golf can be played at Burnham and Berrow Golf Club which is a 5-minute drive away. The Somerset Rebels speedway team are located 3 miles from the hotel. Cheddar Gorge, Glastonbury Tor, Wells Cathedral, Weston-super-Mare, Clarkes Village and Taunton can be reached in under 30 minutes. Highbridge train station is 2.3 miles away. The Royal Clarence Hotel 18+ only has been welcoming Booking.com guests since 13 May 2013. When would you like to stay at The Royal Clarence Hotel 18+ only? This twin room has 2 single beds. An en suite bathroom with towels is provided. It has a TV, a hairdryer and tea/coffee making facilities. Please note, this room is located on the 1st or 2nd floor and is accessible via stairs only. 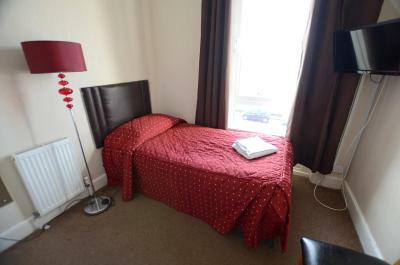 This double room has an en suite bathroom with towels provided. It has a TV, a hairdryer and tea/coffee making facilities. This room has a double bed and features a sea view. An en suite bathroom with towels is provided. It has a TV, a hairdryer and tea/coffee making facilities. Please note, this room is located on the 2nd floor and is accessible via stairs only. This room has an en suite bathroom. a TV, hairdryer and tea/coffee making facilities. Towels are provided. Economy rooms may be smaller and/or awaiting redecoration. They have the same facilities as our other rooms and are located on the first and second floor. Accessible by stairs only. Economy rooms are smaller than the standard or sea view rooms and are located on the first and second floor. Accessible by stairs only. This small single room features sea views and has a private bathroom located across the landing for the sole use of the guest. The Royal Clarence Hotel was built around 1796 and is the only hotel on the seafront in Burnham-on-Sea. Situated just yards from the main High Street and over a dozen quality eating places, we are ideally located for your business or leisure break. House rules The Royal Clarence Hotel 18+ only takes special requests - add in the next step! The Royal Clarence Hotel 18+ only accepts these cards and reserves the right to temporarily hold an amount prior to arrival. After booking your room, the property will send an email with current check-in information. Please note that the reception may close earlier than stated depending on occupancy levels. If reception is expected to close before 22:00, guests will be contacted on the UK mobile number provided. The property has an easy to use key safe system for guests arriving outside of reception hours who have contacted the property in advance. Due to the large number of eateries in the immediate vicinity of the Hotel, the property does not provide or offer food. Guests are welcome to bring takeaway food back to the property to eat on the first floor seafront veranda. Plates, cutlery, napkins, glassware and a microwave are provided. Please note that there is no elevator within the property. Guests with mobility concerns should contact the property to discuss arrangements prior to booking. During the winter, rooms are heated from 06:00 to 09:00 and from 17:00 to 22:00. Heaters are available to hire for a small fee should guests require in-room heating at other times. This adults-only hotel and can only accommodate guests over the age of 18 years only. Children cannot be accommodated. Lack of free parking (6 spaces for 19 rooms). Had to pay from 9am every morning. The decor was spartan. Sea view was very restricted. No bar. Burnham was very grim and full of chavs. Seagulls were dirtying the car continuously. The shower was clean but took 20 mins to heat up. Beverages kept being piled up in the tea cups. Not enough coat hangers. We had a comfortable ,warm , friendly stay..
Limited parking spaces for residents. Bathroom door has swollen into the door frame making opening and especially closing difficult. I would have liked to be able to open the window more.